Now that summer has ended, people everywhere are seeking out classic fall flavors. While for some that might mean anything pumpkin spice, there are plenty of autumnal flavors that online pastry students will learn about that were enjoyed long before Starbucks’ famous spiced beverage. There are few desserts that can better complement a hot cup of apple cider than a decadent maple-glazed, bacon-encrusted doughnut. Baked by Rachel explains that this recipe is the ideal combination of sweet and salty, and it’s perfect for kicking off the fall season. Start with the doughnuts. Activate your yeast in warm milk and a teaspoon of sugar. While it foams up, mix your flour, sugar, salt, egg, vanilla and shortening. Once the yeast is ready, slowly pour that into your mixing bowl as well. When the dough is evenly combined and sticky, grease your hands and form the mixture into a ball. Place your dough into a greased bowl. Cover and let rise in a warm room for about 45 minutes, or until doubled. After the dough rises, roll the dough on a lightly floured surface to about ½ – ¼ inch thickness. Cut out your doughnuts into any shape or size you prefer. Let the dough continue to rise as you prepare the oil. Heat your oil in a stock pot to 325 degrees Fahrenheit. Have your thermometer ready; too hot will burn your doughnuts, too cool will leave them greasy. When the oil is ready, fry 2-3 doughnuts at a time, turning until both sides are lightly golden brown. Set aside to cool. While the doughnuts are cooling, prepare the maple icing and the bacon topping. Beat together powdered sugar, maple syrup and water until smooth. Fry up your bacon. Estimate about one piece of bacon per doughnut. When finished, chop up the bits and set aside. Dip the doughnuts into the icing, then sprinkle the bacon on top. Mix together sugar, water, light corn syrup, red food coloring and (if you like) cinnamon in a heavy-bottomed saucepan. Your candy thermometer is a must for this recipe; set it up so the tip is submerged but not touching the bottom of the pan. Let the mixture heat up and start to boil on high while you prepare your apples. 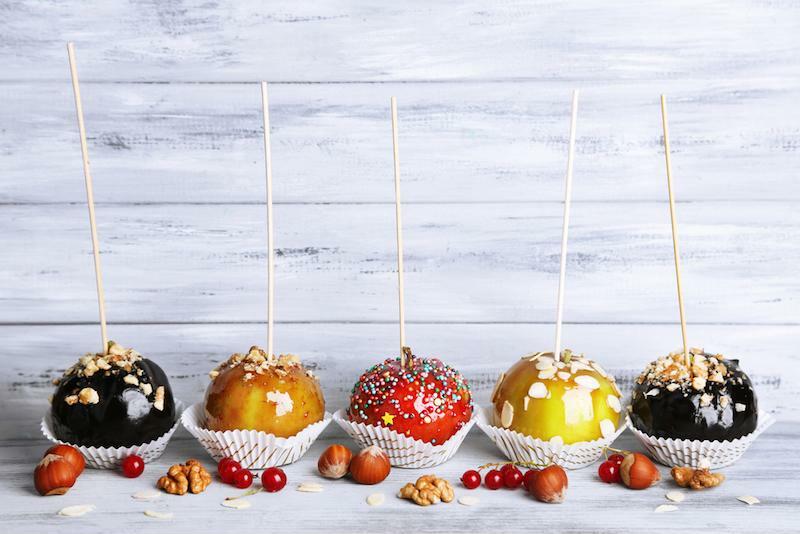 Apples coated in candy, chocolate and caramel are a classic fall treat. Wash and dry your apples, then stick them with wooden skewers so you can dip them easier and hand them to your friends mess-free. Get the stick most of the way through the apple without coming out the other side. Line a baking sheet with parchment paper, then sprinkle some demerara sugar on top. If you’re craving some pumpkin spice flavor, now’s your chance; just mix it with the sugar. By now, your mixture should be nearing 310 degrees Fahrenheit. Don’t let it go over this point; remove it from the heat. Now it’s time to dip your apples in. Spin them around so they get a good, even coating. Place each one on your sugared pan to cool and dry. If you want to mix it up, set some apples aside for chocolate- or caramel-coated apples. Melt some chocolate chips and dip your apples in, then set aside to let cool. Before the chocolate sets, add sprinkles, marshmallows or other tasty decals. For caramel apples, mix butter, brown sugar and light corn syrup in a saucepan until boiling. Stir in sweetened condensed milk in a saucepan, then let the mixture reach 248 degrees Fahrenheit on your candy thermometer. Now, dip in your apples and set aside to cool.